A barley twist is a common British and American furniture turning. This generally takes a single or double twist format and is very distinctive. It lends itself well to any straight or slightly tapered section of a spindle turning. 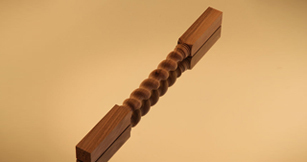 Barley Twist can be carried out in a left or right hand pitch and is suitable for a broad range of items such as kitchen pilasters, staircases, porch and architectural columns to name but a few.